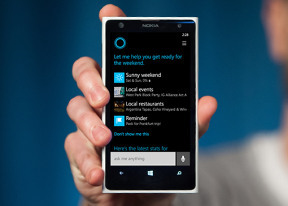 We already said Windows Phone 8.1 feels smoother than its predecessor, but is it really? Well we've decided to run some benchmark tests and see how the new OS performs under pressure. Microsoft has done quite a few optimizations for sure, so we are eager to see how the update is handled by different phones. We had three Lumia phones around for our tests - Lumia 720, Lumia 1020 and Lumia 1520. We rаn each benchmark on Windows Phone 8 with GDR3 and Nokia Black updates, and then we've updated all three devices to the latest Windows Phone 8.1 Developer's Preview. The first test measures the single-core performance by calculating the Number Pi. All phones scored the same on both version of the OS, but that's hardly surprising as it's a strictly CPU-intensive test. Then we got to the compound test AnTuTu. All three Lumia phones showed no significant rise or drop in the performance. So there is nothing conclusive about any potential performance benefits of Windows Phone 8.1. Finally, we used the popular cross-platform BaseMark OS II compound benchmark. The three Lumia phones scored noticeably higher when running on the Windows Phone 8.1 update, testifying that the Windows Phone 8.1 OS indeed brings about a certain performance boost over its predecessor. Windows Phone 8.1 comes with a brand new Internet Explorer 11 web browser that brings lots of new goodies and… performance improvements. We explain all the new stuff a bit further down, but for now we'll just show you how the new IE11 stacks against its previous version and other competing web browsers. BrowserMark 2 compound benchmark tests the web browsers in several departments. While Internet Explorer 11 is still behind its competitors, it is definitely better and faster than the IE10, which comes with Windows Phone 8.0. Finally, we put the phones through the standard HTML5Test and the entire gang showed similar bump in its HTML5 capabilities, courtesy of Windows Phone 8.1. So overall, the new OS brings along a definite speed improvement over Windows Phone 8. We hope to see the final version does even better in this respect.